Yesterday, myplasticheart released this retailer exclusive strawberry colorway of Andrew Bell’s awesome Kill Kat vinyl figure! This Valentine’s Day, share a Strawberry Kill Kat with the one you love! These evil Strawberry Kill Kat wafers are coated in a thick layer of tasty Artisanal Ghost-Infused Strawberry Ectoplasm! Now with 20% More Berries Murdered per serving. Are sugary treats killing us? Kill Kat is certainly trying! These evil wafers are determined to cause some damage. 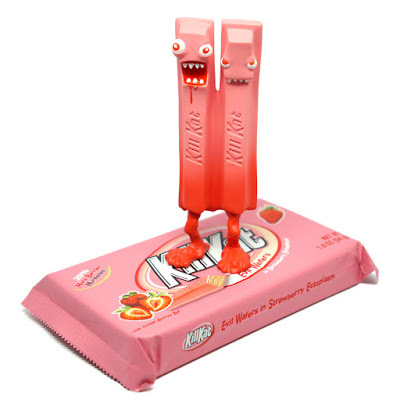 This sweet and psycho conjoined candy stands 6” tall and comes in a candy wrapper style package. The myplasticheart Exclusive Strawberrry Kill Kat vinyl figure by Andrew Bell is limited to just 50 pieces and retailed for $49.99. Sadly, this delicious looking figure sold out almost immediately upon release!